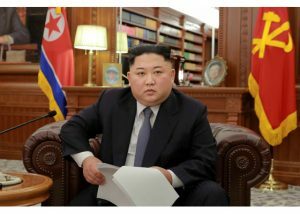 Kim Jong Un gave his much awaited 2019 New Year’s speech on the morning of January 1. Considering the many breakthrough events of the past year, there was not much room left for a big surprise. His speech included the usual message of recognition and gratitude to the nation, duly mentioning various professions and highlighting some of the major construction projects of the year, such as the Wonsan tourism zone and Samjiyon County. He repeated his willingness to freeze the nuclear program, demanded that sanctions are dropped, and extended invitations for cooperation to South Korea and the United States. But was it all business as usual? No. There was one remark that carries a hugely significant strategic meaning way beyond the narrow scope of the year 2019, as will be discussed after looking at a few noteworthy formal aspects. For the first time since Kim Jong Un started giving televised New Year’s speeches in 2013, the setup was reminiscent of a North Korean version of a state of the union address. He normally gave his speeches standing behind a podium in an assembly hall. This time, the North Korean leader sat in a massive armchair in one of his offices. The seating did not seem to be very comfortable; Kim moved around quite a bit while he was talking. Perhaps a chair with lower or no armrests behind an office desk would have been a better choice. As in 2018, Kim was wearing a Western suit and tie, not the North Korean cadre uniform. The former is typically interpreted by North Koreans as a hint at his role as a cosmopolitan statesman and is supposed to add weight to his words. The address lasted for 31 minutes and had been pre-recorded. As the clock standing behind Kim Jong Un showed, the leader started speaking at 12:03 and finished at 12:55. This means Kim actually spent an extra 21 minutes that went unrecorded (or at least was not broadcast). We can only speculate whether he used that time for a break, or whether he needed several attempts to repeat single passages. In any case, it is somewhat surprising to observe such an obvious failure of his PR team. This example adds weight to the argument that field research in North Korea does make sense despite all limitations. If the regime cannot even orchestrate a 31-minute speech by the leader without glitches in the matrix, how can they present a perfect Potemkin village to an expert visitor who stays in their country for several days? All it takes is experience, patience and a sharp eye. Kim held a simple printed manuscript in his hands at which he looked occasionally, but not very often. This means that either he had memorized the speech, or, more likely, he was reading from a teleprompter. His eyes were indeed moving from left to right while he spoke. The unadorned manuscript—no leather folder with a gold emblem, just plain white paper held together by a clip—seemed out of place in the otherwise elaborately decorated setting. Perhaps the idea was to show the North Korean people a busy leader who just interrupted his important work to make the address and who would afterwards quickly return to his duties. In this case, the extra 21 minutes would have somehow ruined that message of casualness. A few more oddities could be observed. Unlike other leaders who address their citizens at similar occasions, Kim did not look straight into the camera a single time. Together with the taped applause that could be heard at the beginning and at the end of his speech, the idea was perhaps to create the impression that he was speaking to a large crowd. However, this stands in contrast to the choice of the intimacy of his office as the location, making the applause sound a bit like what we know from US sitcoms. The grey carpet with a modern white irregular pattern that vaguely reminded of a camouflage tarp was in sharp contrast to the conservative and unadventurous wooden furniture. Kim Jong Un began his 2019 New Year message as in 2018 by addressing his fellow North Koreans (“dear citizens and servicemen”) and Koreans in the South and abroad (“dear brothers and sisters of our nation”). This time, Kim in addition reached out to non-Koreans: “dear comrades and friends.” This shows the confidence and self-perception of North Korea as a global player, based on the country’s status as a nuclear power and the broad international recognition after the 2018 summits in China, South Korea and Singapore. Later, images of these summits and of the state visit by the Cuban leader were shown to illustrate Kim’s words. The very first sentence in the actual text already points at what is perhaps the most important message of the whole speech. Kim uses the formulation “undeletable deep historical footprint” (지울수 없는… 력사의 깊은 발자취). In other words, Kim regards the achievements of 2018 as irreversible, no matter what the enemy—namely, the US and conservative forces in South Korea—will do. If we look at this together with the key sentence in the whole speech—the warning that “we even might find ourselves in a situation where we have no other choice but to find a new way (새로운 길을 모색하지 않을수 없게 될수도 있습니다) for defending the sovereignty of the country and the supreme interests of the state and for achieving peace and stability of the Korean peninsula,” we see an almost exuberant confidence. Rather, Kim’s confidence stems from the expectation of growing and reliable support by China. The three summits with Xi Jinping in 2018 seem to have made Kim Jong Un very optimistic. The ongoing trade war between Beijing and Washington, including the arrest of a top manager of Chinese telecom giant Huawei in Canada, creates the impression among strategists in Pyongyang of a Cold War 2.0 situation. Like in the decades before the collapse of the Soviet Union, supporting smaller allies could again become a matter of principle for the Big Powers even if these allies step out of line occasionally. The not unfounded hope of Kim Jong Un is that in such a strategic setting, China would be willing to provide protection and economic support while abstaining from too massive direct interference. Forcing the US out of Korea, and out of East Asia, is more important to Beijing than reigning in on a self-confident or even provocative North Korea. I thus interpret Kim’s threat of “finding a new way” not as a hint at more nuclear tests, but rather as a message to Donald Trump: You are not our only option for security and economic development. If you refuse to be cooperative, we will ignore you and turn to China. Oh, and we will take South Korea along. It remains to be seen how realistic such a threat is, as it always takes two to tango. It is not at all certain that China would indeed provide full support to such an unreliable and difficult ally as North Korea. Furthermore, Pyongyang would not feel very comfortable with expanding its already overwhelming dependency on China. But the North Koreans have in the past been masters of tactical flexibility and used even the slightest weakness of their opponents—in other words, everybody else—to their advantage. In his 2019 New Year’s address, by pointing at “finding a new way,” Kim Jong Un has thus threatened to start a new round of the old balancing game that Kim Il Sung had played with Beijing and Moscow in the 1950s during the Cold War. Even if his demands are not fulfilled, Kim Jong Un will not give up on cooperation with Washington permanently, because it can be nicely used as a tool to extract concessions from China. He might hope to be able to do the same with Donald Trump, just the other way around. And in case the two Big Powers refuse to play, he can, unlike the situation in the 1950s, use his nuclear threat to force them to pay attention. South Korea must be careful not to become a pawn in this game.